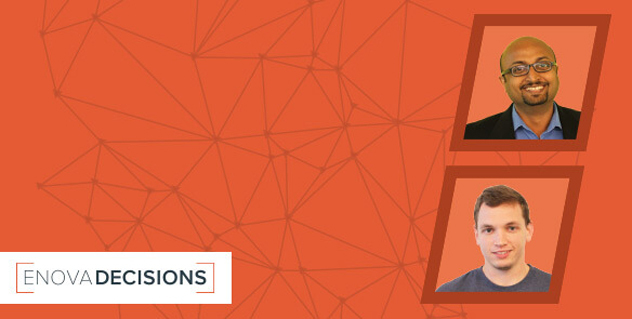 Inside Enova Decisions™ Part 2, Featuring Vinod Cheriyan and Mark Rozpadek - Enova International, Inc. Welcome to Part 2 of our Enova Decisions feature this month! If you missed Part 1, you can catch up here. This week we dive deeper into Enova Decisions, our analytics-as-a-service brand, with Vinod Cheriyan, Senior Data Scientist, and Mark Rozpadek, Data Scientist, for Enova. They discuss the technical aspects of Enova Decisions, giving a glimpse into the work that went into building the Colossus™ real-time decisioning platform and touch on new client integration. What kind of work do Data Scientists cover for Enova Decisions? The main goal for data scientists is to alleviate the technical burden for developers and analysts. Part of that includes taking tasks that the analytics team can own off the developers’ table — this helps free up the development team to concentrate on other projects. “We help our analysts do their job as efficiently as they can without having to deal with roadblocks or jumping through hoops,” says Mark Rozpadek. Another thing the Enova Decisions’ data science team is currently working on is a centralized system to calculate and store model variables. The benefit of such a storage system is that it will allow analytics as a whole “to define variables in order to prevent mistakes and save developers time,” according to Rozpadek. The team also does research when looking to implement new tools and methodologies. “At the end of the day, what our team does, similar to what Mark talked about, is to investigate tools and technologies and develop our own tools and processing, so that the workflow for analytics is improved,” Cheriyan explains. What is Colossus and what went into building it? Colossus is a sophisticated model-running engine. “We have our analytics team and developers developing models — they can use whichever tools they like, such as SAS®, R or Python™ — and when they are ready for the model to go into production we translate them to the Colossus platform,” Cheriyan states. Because clients of Enova Decisions are typically online businesses, they require sub second response time in order to provide an exceptional customer experience while the customer is interacting with the company on its website. Colossus is designed as a core engine or framework with “plug and play” modules. The Colossus framework makes it simple to quickly switch out and redeploy modules — it’s what allows Enova Decisions to be very responsive to market changes where the business needs to move quickly. Another goal when building Colossus was developing quicker response times and more flexibility. Enova Decisions is currently onboarding its first international client. How has the process been so far? Visit the Enova Decisions site to learn more.